Buy Light Chinese Calligraphy Wall Scrolls! 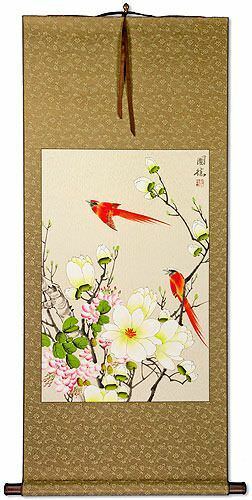 We have many options to create artwork with the Chinese characters / Asian symbols / Japanese Kanji for Light on a wall scroll or portrait. If you want to create a cool Light Asian character tattoo, you can purchase that on our Chinese and Japanese Tattoo Image Service page and we'll help you select from many forms of ancient Asian symbols that express the idea of Light. 明 means light, bright, clear, clarity, to understand, or wise. In Chinese this can refer to the Ming Dynasty (1368-1644) where it can also be the surname Ming. In Japanese, this can be romanized many different ways when used as surnames or given names. 明 is a partial list of those names: Meishuu, Mei, Min, Myoujin, Myou, Hinata, Haru, Toshi, Tooru, Sayaka, Saya, Satoshi, Asumi, Akera, Akemine, Akesaki, Ake, Akuru, Akiraka, and Akira. In the Buddhist context, this represents vidyā (knowledge). To expand that, Buddhists understand this to mean bright, clear, enlightenment, wisdom, or to understand. It represents Buddha-wisdom and its revelation; also the manifestation of a Buddha's light or effulgence. This Chinese proverb literally means: [If one not does] not make comparisons, [one will] not know [the truth] when [one] compares, [one will be] greatly surprised. This goes to the idea that if you do not know bad times, you cannot know what good times are. You can not know light without experiencing darkness. Another way to translate this would be: If you wish to be enlightened, you need to make comparisons and analyze every aspect (of a situation, issue or problem). 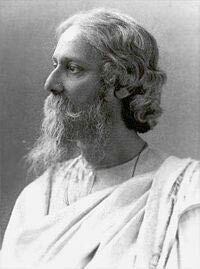 This is a philosophical poem/quote from Indian Poet and Philosopher, Rabindranath Tagore. This quote is not sourced, and therefore several variations exist in English. Some suggest the original was in the Bengali language. 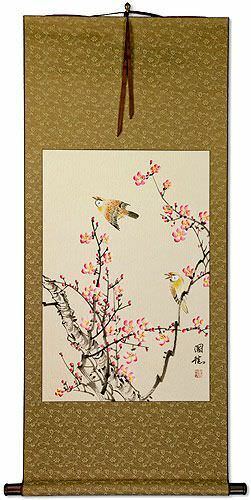 This, of course, is the Chinese translation which has the meaning of, "Faith is the bird that feels the light and sings when the dawn is still dark." 一道神光 is a Buddhist term that means, "inner light," or "intuitive wisdom." This actually reads, "[the] one path/way [of] spiritual light." It implies that your spirit knows the way, and will light the path for you. 光明 is a nice way to say "light" in Chinese, and old Korean Hanja. 光明 is because the word also suggests a bright future or refers so someone who is very promising (great future potential). The first character means light or bright. The second character means bright and clear (in this context). 光明 appears in most Japanese dictionaries but it not the most common Japanese Kanji word for light (more commonly used for the name Mitsuharu). In old Korean Hanja, this can have a meaning of brightness or brilliancy. In the context of Buddhism, this means, "Light emanating from a Buddha or Bodhisattva, symbolizing their wisdom and compassion"
光 is the simplest way to express "light" in Chinese, Japanese Kanji, and old Korean Hanja. It can also mean ray or bright. Chinese tend to use a two-character word for light/bright, so this character is probably best if your audience is Japanese. Also, when pronounced Rei, this can be a Japanese female given name. 月光 is the Chinese, old Korean Hanja, and Japanese Kanji title for moonlight. This can also be used to describe a moonbeam, and can be a given name all three languages (pronounced as Rumi when used as a female given name in Japanese). 光芒 is the Chinese, Japanese Kanji, and old Korean Hanja for radiance meaning rays of light, brilliant rays, beams of light, etc. 光芒 is the radiance you feel when the sun hits your face in the morning, bringing you warmth while kickstarting your vitamin D production. This Japanese proverb means, "Bright Future." It suggests a lot of possibility and potential awaits in your future. A great gift for a graduate. The first part of this proverb literally means bright or light. The second part means future but can also be translated as, "the world to come." 道 is the character "dao" which is sometimes written as "tao" but pronounced like "dow" in Mandarin. 道 is the base of what is known as "Taoism." If you translate this literally, it can mean "the way" or "the path." 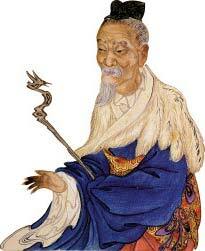 Lao Zi (604-531 BC), who followed, and added to the teachings of Confucius. More about Taoism / Daoism here. Note that this is pronounced "dou" and sometimes "michi" when written alone in Japanese but pronounced "do" in word compounds such as Karate-do and Bushido. It's also "do" in Korean. Alternate translations and meanings: road, way, path; truth, principle province. Important Japanese note: In Japanese, this will generally be read with the road, way, or path meaning. Taoism is not as popular or well-known in Japan, so that Daoist/Taoist philosophy is not the first thing a Japanese person will think of then they read this character. 真主 is how Chinese Muslims refer to God (it literally means "True Master"). Oddly, in China, two different names for God have emerged. Even though Muslims, Christians, and Jews all worship the same God of Abraham. In Arabic, the word Allah is just the Arabic way to say, God. Arab Christians pray to Allah, just like Arab Muslims. Somehow in China, the title of God diverged. If you are curious, there are millions of Muslims throughout China but especially in the northwest portion of China known as Xinjiang. Here you will find descendants of Turkmen, Persian, Arab, and other ethnicities. Some are mixed with Han-Chinese blood; others appear to be pure Turkmen. Many have fair complexions, green eyes, and light hair but all are citizens of China. A visit to Xinjiang will shift your paradigm and blow away all of your stereotypes about what it means to be Chinese. This Kanji often represents a Japanese name romanized as Hikari. The literal meaning can be the sunshine, light, or to shine upon. It has the same meaning in Chinese and Korean. From ancient Chinese, it is a variant of 輝/辉. Other Japanese romanizations include Hikaru, Hikatsu, Teru, Terasu, Ki, and Akira. This can be translated as "martial arts skills," "warrior skills," or "military skills" depending on usage. In both Japanese and Chinese, rather than meaning martial arts, this speaks more to the skills that you posses in regards to martial arts. This phrase also has a light suggestion of "having an itch to show off these skills." 紫 is the single-character Chinese, Japanese and old Korean title for the color violet / purple. The difference between violet and purple is not really distinguished in Asian languages. However, sometimes a character for "light" is added to the front of this one, which might be closer to the meaning of violet. This is "shiken haramitsu daikōmyō," a famous Japanese Buddhist mantra. 四拳 = shi-ken = four fist (many translate this as "four hearts"). 波羅蜜 = ha-ra-mitsu = A loanword representing pāramitā, or entrance into Nirvana. Awkwardly, it also means jackfruit. 大光明 = dai-kou-myo = big/great light bright (great bright light). 1. The Merciful Heart - Love and caring for all living things. 2. The Sincere Heart - Pursues righteousness, or the right path - sincerely trying to do what is right. 3. The Attuned Heart - Knows that nature and fate have their ways, and thus stays in tune with the universe. 4. The Dedicated Heart - Steadfast on the chosen path to the end. 晴朗 is the Chinese, Japanese Kanji, and old Korean Hanja for sunny and cloudless. This can also mean: fair; serene; clear and bright. This usually refers to the clear weather and sunny skies. This Japanese proverb means, "time flies like an arrow." It's very similar to the English idiom, "time and tide wait for no man," or "life is short." 光陰 = Time (the cycle of light and dark). 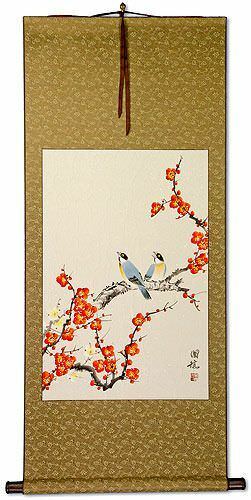 財富 means wealth or riches in Chinese. Hanging this on your wall will label you as a "lover of money" or a "greedy person." Order this, only if you don't mind being seen in this light. This would be the ultimate Chinese "welcome mat." Except it will be on your wall, and people will not step on it. In a somewhat literal translation, you could say it means, "I feel happiness as I welcome you, as you have brought a shining light to this place with your arrival" or in a more simple way, "I am happy you've come as your presents really brightens up the place." It has become common for this greeting to be announced by the staff upon the arrival of any customer in to a fancy store in China. You will also see these characters on the "welcome mats" in front of 4 and 5 star hotels in China. Having this on a wall scroll is an extra nice touch. I have seen a few horizontal scrolls with this phrase on the wall behind the reception desk of better hotels, or near the front door of fine shops. At the most fancy department stores and restaurants in China, several greeters (almost always young women) will stand by the front door all wearing sashes with this phrase embroidered on them. As you walk in, they will bow and say "huan ying guang lin" to welcome you to the establishment. Note: The first two and last two characters do make words in Korean Hanja but seldom used as a sentence like this in Korean. A lot of people search our website for "white." I am not sure the purpose, unless your family name is white. 白 is the universal character for white in Chinese, Japanese Kanji, and old Korean Hanja. In certain context, outside of the white definition, it can mean snowy, empty, blank, bright, clear, plain, pure, innocence or gratuitous. In Korean, this can be a family name romanized as Paek or Baeg. While this means mirror in Chinese, Japanese Kanji, and old Korean Hanja, it's commonly used as a metaphor for something beautiful and bright or something that provides clarity and insight.